Above is a map of well locations from UT Lands and some geologic features from the Bureau of Economic Geology. Quickly looking at this three different area pop out immediately. In Reagan county there is a lot of activity with the exploitation of the Wolfcamp. As the Ozona arch and Big Lake fault can provide some interesting geologic features, the better part of the Wolfcamp reservoir quality lies in the northeast section of data points. Thankfully there are a lot of well control points to choose from for vertical and horizontal wells. Up north in Midland Basin is the heart of the Spraberry trend. Wells along the Martin and Andrews county line will provide a wonderful analog in this area. 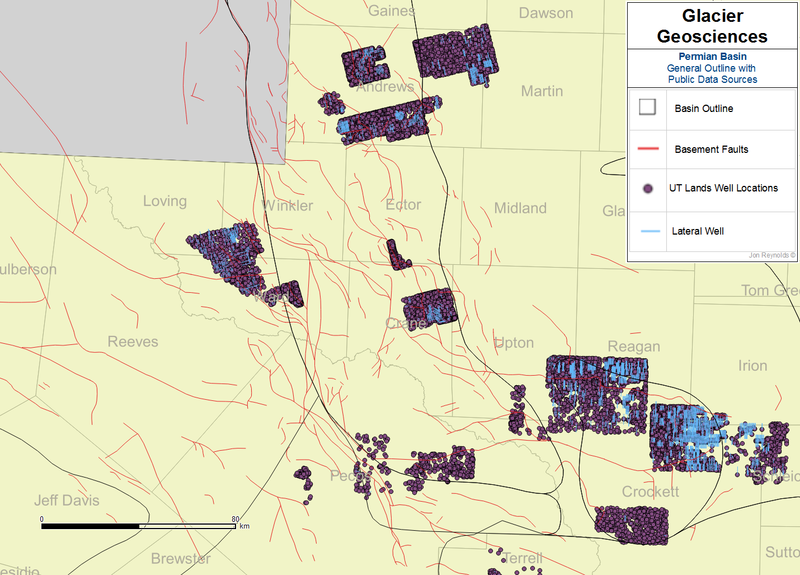 Delaware Basin is the sleepy giant that has gotten a ton of press in the last two years with large IP rates from short laterals. The basin has slightly higher pressures than Midland but the acreage blocks are more of a shotgun blast / military camouflage type pattern. In picking well control points you need to stay away from that eastern basin outline. Also, the faulting to the south presents some challenges as well. All maps were put together using free software and freely available public data. QGIS was used as a mapping software. And UT Lands and BEG were used as data sources.